Our primary objective as stallion managers is to keep our customers in business. We know that our judgement on the choice of stallion that we represent is critical to your success. We agree with Bull Hancock “a good bull is worth half the herd, a bad bull is the whole herd”. Quality mares lend incredible power but a good stallion can upgrade even the weakest mare. 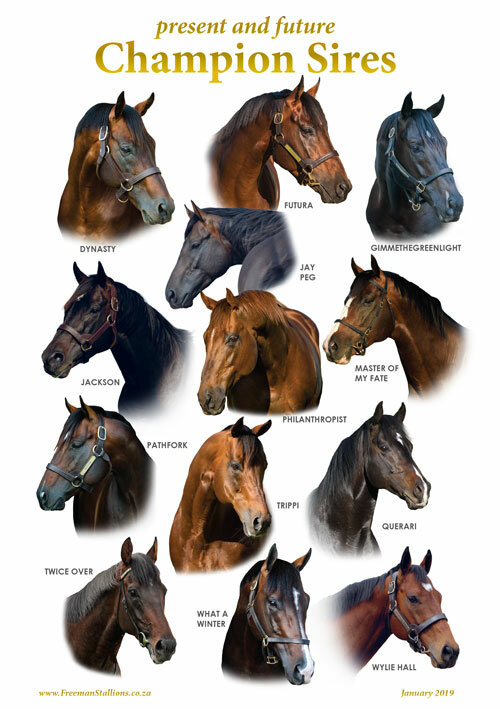 Quality sires are the key to success in any thoroughbred operation. Being sure that we represent the right stock is the only way we can load the dice for you. There are two expressions of fact that we prize above all else in our industry — they epitomise the pinnacle of our endeavours: “Gr1 winner” and “Champion”. Phenotype and Genotype are vital but these are a matter of conjecture and often dictated by fashion. However there are only so many Gr1 winners in the world and even fewer champions, we have been well served by keeping our portfolio aimed at perfection. The Thoroughbred is man’s finest genetic achievement because: the second hand of a clock separates the best from the worst. The winner gets his advantage from all that is given to him in creation. This is our quest. It is a privilege for us to represent the SUPER-SIRES in this portfolio, they tick the right boxes or they wouldn’t be here. We hope that our stallion portfolio will help you in the vital decision making process in the mating of your mares. If you are a buyer we hope that you find inspiration to guide you in your selections. Never in the history of South Africa thoroughbred breeding has a single portfolio of stallion power contained the scope and calibre of proven class and provident credential of new young bloodlines combined with top racing quality. With over 44 years’ experience in the thoroughbred industry, specialising in stallion selection and management, John Freeman set the benchmark in a one-stop stallion syndication, management and marketing service. The Freeman Stallions portfolio has long included the top-end of present and future champion sires. Their management team look after most of South Africa’s most successful stallions and an unrivalled series of champion sires. A strict set of criteria for the selection of new additions to the portfolio is rigorously applied to ensure that the high strike rate of the Freeman Stallions portfolio is maintained. The agency counts amongst its successes a noteworthy list of champions purchased as yearlings for clients. John is reluctant to claim sole right to the success of any horse that he has helped select as a yearling (believing that the top end of his client base add huge value to the selection process and that the trainer’s involvement always deserves prime recognition). He is happy to list some that were not directly bought for their ultimate owners and some that he “owned” himself (when buyers forget to pay or horses are bought on spec): ENCHANTED GARDEN (The first ever female Horse of the Year in SA bought for an owner who forgot to pay), NATIONAL EMBLEM (a Champion racehorse at 2, 3, 4 and 5 years – bought on spec with Charles Laird and placed into a partnership after the sale), SAN CARLOS (bought for an owner who disappeared, horse later resold at a loss – Champion racehorse and winner of over R1m), RIP CURL (same story as SAN CARLOS), LEOPARD STRIKE (winner of South Africa’s first ever R1m race for 2yo’s – John owned half this horse for the first five months after the sale). 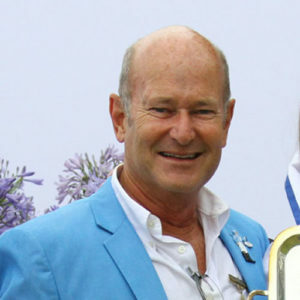 Others that have had significance in John’s career as a buyer of yearlings include: FREE MY HEART (Horse of the Year 2002 and Champion Older Horse – 6 Gr1 wins), ROMAN CHARGER (Cape Champion 2yo – 2001), COLONIAL GIRL (purchased as an unraced 2yo – Gold Cup Gr1 winner and Equus Champion Female Stayer 2000), DYNASTY (2003 Horse of The Year and four times Equus Outstanding Stallion), PAST MASTER (winner of the 2011 J&B Met), Ivory Trail (record setting Gr1 winner), RUSSIAN SAGE (dual Gr1 winner later sold for R13.6m), IN THE FAST LANE (Champion 3yo filly), JACKSON (triple Gr1 winner, John was outbid in the ring and secured half the horse privately for Jack Mitchell later). Recent years have been especially rewarding. Horse of the Year LEGISLATE who won 4 Gr1 races and R5.76m was purchased for a mere R90,000 from Cheveley Stud on spec with Jono Snaith. Snaith Snr approached John and Jono and asked them to let Dennis Evans of Newbury Racing take over the sales slip. John had, at the same sale, purchased Horse Of The Year and four-time Gr1 winner of R4.3m FUTURA in partnership with Jack Mitchell for R500,000. The 2017 to 2018 season marks the highlight of the successes of John’s clients both in yearling selection and in breeding barns: John considers it very fortunate that TWICE OVER, the UK Champion Racehorse that he imported and syndicated with Bernard Kantor provided his clients with the stallion’s first two Gr1 winners (from his first crop); Queen’s Plate and Durban July winning Champion 3yo DO IT AGAIN and Gr1 winning 2yo KZN Champion SAND AND SEA, more than he could wish for from TWICE OVER so early in his stud career. Of equal importance are the two top fillies in the same season; dual Gr1 winner and Equus Champion 2yo LADY IN BLACK and dual Gr1 winner and Cape Champion 3yo SNOWDANCE. Both secured at the yearling sale by John for leading owners Jack and Mitchell and Drakenstein stud who now have LADY IN BLACK in their paddocks. John also advises a few long standing clients on breeding. They account for many stakes winners including recent Gr1 Cape Guineas winner TAP O’ NOTH, triple Gr1 winner and Equus Champion RABIYA, and yet another very promising son of TWICE OVER in DOUBLEMINT etc. John is also publisher of SA’s ‘Racing Bible’ the SA Turf Directory. The directory first went into production in 1985 and is South Africa’s longest running publication. The book lists the details of over 7000 owners, trainers, breeders, agents, administrators and commercial enterprises in the South African Racing and Breeding Industry. Visit www.saturfdirectory.co.za for information about ordering your copy or advertising in this publication.